The purpose of Hope for Congo’s trip to Kandale was to take part in an event needed to help the community overcome its history. Our interest in the community stems from our childhood connection to the mission station that was part of the Congo Inland Mission, now known as AIMM (Africa Inter-Mennonite Mission). Originally known as the Kandala Mission Station, it was burned to the ground in 1964 by members of the Congolese-led Simba group. The Simba (Swahili for “Lion”) rebels were born of a new conflict against the four-year-old Congolese government. The primary leader of the Simba rebels was a man named Pierre Mulele of the Bapende ethnic group. Mulele was an avowed Maoist and was supported by Communist China. Along with a Maoist political worldview the Simba incorporated aspects of their African worldview with its animistic beliefs and practices. They roamed in groups bringing terror, death, and destruction wherever they appeared. Jeunesse, a French word meaning “youth,” was a common term used to refer to gangs of young men who were dissatisfied with how the official independence of 1960 failed to meet their demands. Their attacks were aimed predominately at government centers. However, mission stations were also attacked because of their close link to the government. On a Tuesday evening in January 1964 the Simba rebels approached Kandale. First the gangs set the village on fire. Then they moved to the Kandala Mission Station. There they captured seven missionaries and two young missionary children, approximately seven years old. Next they burned the station to the ground and destroyed the missionary homes. Our parents and youngest sister were among the hostages. The missionaries were held captive until a negotiated release obtained their freedom. The UN rescued them on Friday of the same week. Kandala was not the only mission station attacked. The Kwilu Rebellion impacted both Protestant and Catholic missionaries. The most remembered hostage situation took place later in the city of Stanleyville. It included the death of missionary doctor Paul Carlson. His story is recorded in the book, Out of the Jaws of the Lion. Ultimately the Kwilu Rebellion failed. However, it contributed to the ongoing chaos and instability that continues to challenge the people in Congo today. Mobutu eventually came to power and raped the country of its resources and potential. The attack at Kandale resulted in a series of broken relationships within the community between those who participated locally in the events of that week and those who did not. Many struggled with a sense of guilt for not being able to stop the destruction of the mission station and capture of the missionaries. The community has been mired in a combination of those broken relationships and guilt for the past 54 years. All of this added up to a sense of there being a “curse” on them for their past. Church members and church leadership initiated the desire for reconciliation. The entire community including the local chiefs and government officials embraced it. A Christian businessman became the lay leader of the movement. God, in His timing, brought together a group of individuals from Congo and the United States to play a role in bringing about the needed forgiveness, reconciliation, and a new beginning of restoration for this community. Participants included the Kandale Church and community, the Mennonite Church of Congo, AIMM, Hope for Congo, and REVE Kandale. A delegation of twenty people in five vehicles made the two-day trip from Kinshasa to Kandale. Others came on foot and via motorcycle. As we neared the site, a succession of painted rocks pointed the way and palm branches lined the road. A large group of people surrounded us as we entered the station. A palpable sense of excitement and anticipation rippled through the gathering. The next day at 9:00 a.m. the delegation met with the local chiefs to communicate and acknowledge the past with an eye to the future. We were given symbols of a renewed relationship and a new beginning. This was followed by a large celebration at the church on the mission station from 11:00 a.m. until 5:00 p.m. (Congolese time). The celebration included singing, dancing, and stories of God’s goodness and faithfulness. An estimated crowd of 1000 people inside and outside of the church building shared the joy of what God was doing in that moment. 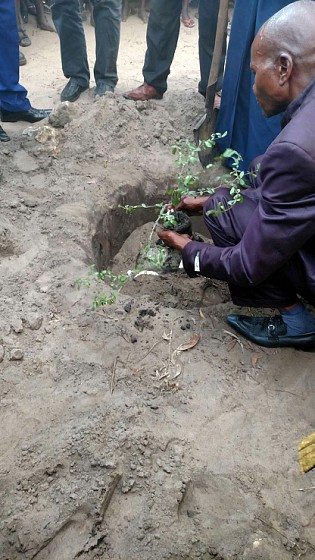 At the end of the celebration on Friday, a shade tree was planted in front of the church as a symbol of new life. It will be a memorial to the day’s events—a visible reminder that can be passed down to future generations. Following the day of celebration we interacted with the community for two more days. Communion was served after the Sunday morning service to bring closure to our trip and to remind us all of our oneness as the family of God. We left late Sunday afternoon and arrived back in Kinshasa at 3:00 a.m. Tuesday morning. Tired? Yes! But grateful and carried along by God’s presence each step of the way. Poverty is a reality that is experienced by all on some level of their lives. I believe it begins with spiritual poverty, which leads to relational poverty, which in turn results in material poverty. The integration of all three can become so convoluted that it is difficult to separate one from the other. Such is the story of what happened in Kandale. The Kandale story is not an isolated one. I have been told there are other places in Congo with a similar history and a similar need for forgiveness, reconciliation, and restoration. What makes this story unique is the miracle God unfolded. In a miraculous way He orchestrated the events leading up to the day of celebration. He answered the prayers of His children. It is now a story that revealed the heart of God and His desire for restoration. The grace of God reached down to lift people out of their broken relationships. Hope for Congo’s goal is to provide tools and resources to our Congolese brothers and sisters, to provide them with the opportunity to participate in the process of lifting their communities out of poverty through the good news of the Gospel of Jesus Christ. Thus a shared lifting of assets can occur in each community to minister to both the body and the soul of each person. Your prayers and donations to Hope for Congo are ways that you can actively participate with us and make an investment that has eternal impact. The Kandale story could be one among many stories of God at work in Congo. How will you be part of those stories? • Praise God for the healing He sent to us through His Son, Jesus. • Pray for the people of Kandale. • Pray for our ministry, Hope4Congo to work effectively for Christ’s Kingdom.